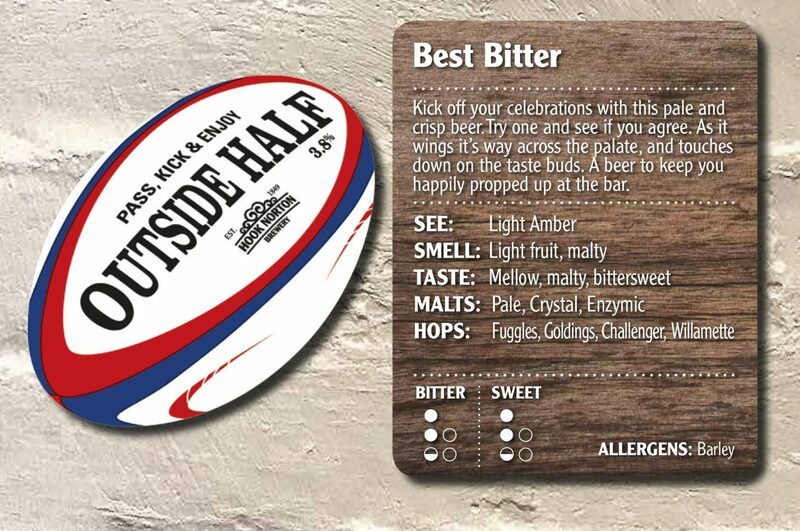 Making its debut in the Championship, Outside Half is the perfect beer to help you stay happily propped up at the bar while the action unfolds. Light amber with a mellow fruity taste this easy drinking ale will touch down on your taste buds with a refreshing touch. Beautifully balanced and brewed by Hook Norton Brewery to celebrate all that’s great about rugby this will support you for the full 80 minutes and beyond and whatever the result you’ll be assured of a cracking pint with which to celebrate or commiserate! Fuggles, Goldings, Challenger and Willamette hops scrum down with Maris Otter Pale Ale, Enzymic and Crystal malts to convert into this match winning ale. Outside Half will be lining up on the bar at the brewery, in Hook Norton pubs across Oxfordshire, Gloucestershire, Northamptonshire, Warwickshire and Worcestershire.